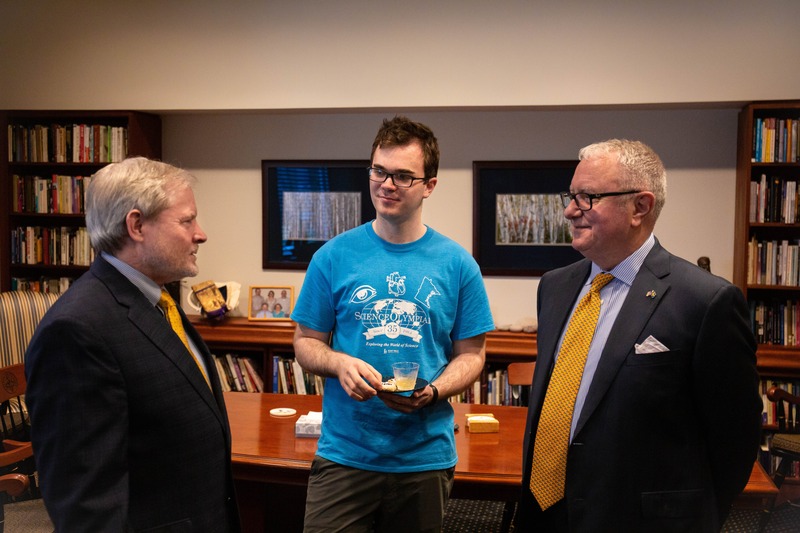 As a recipient of the Swedish Council of America’s Glenn T. Seaborg Science Scholarship, Coe will travel to Sweden in December to present research and rub shoulders with some of the top minds in science. 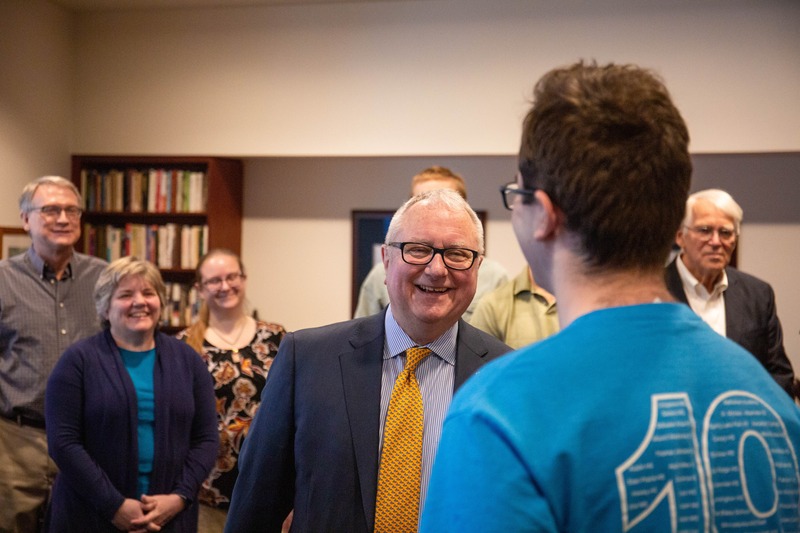 April 12, 2019 | 8 a.m.
“You’re going to want to find a tux,” said Gregg White, executive director of the Swedish Council of America (SCA), with a chuckle. 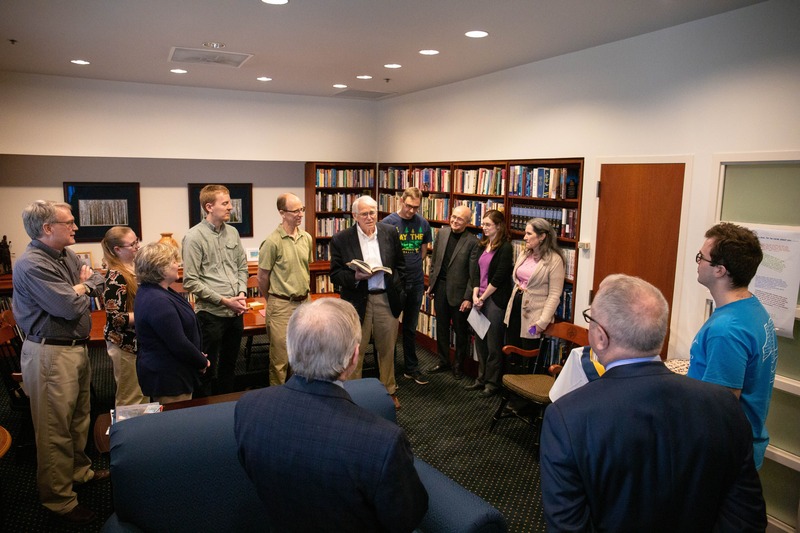 He joined President Jay Barnes and 10 physics faculty members to surprise Aaron Coe ’19 with the 2019 SCA Glenn T. Seaborg Science Scholarship on April 5. As he opened the door to the president’s office and saw all the familiar faces, Coe looked visibly surprised. But as White introduced himself and explained the accommodations and honors that would come as part of the award, his smile grew. In December, Coe will take an all-expense-paid trip to Sweden for the Stockholm International Youth Science Seminar, an intense week of presentations, lectures by Swedish scientists, and likely meetings with international Nobel Laureates. The week culminates with the students participating in the Nobel Ceremony and Banquet, a once-in-a-lifetime opportunity, “until they win their own Nobel Prize!” White says. According to the SCA website, the scholarship was established in 1979 in honor of famed chemist and former SCA board chair, Dr. Glenn T. Seaborg. In 1952, Seaborg received the Nobel Prize for his work in transuranium elements. He discovered or co-discovered numerous atomic elements, including atomic element number 106, which in 1994 was named Seaborgium in his honor. The scholarship is presented annually to an outstanding student selected from a list of candidates nominated by the presidents of the six Swedish Heritage Colleges that are Institutional Members of SCA. 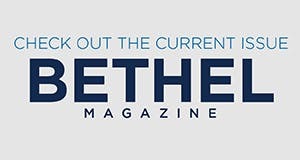 Each of these colleges or universities maintains an active connection with modern Scandinavia through language study, student exchange programs, and cultural events. Coe is a senior majoring in physics and computer science with a minor in mathematics and a 4.0 GPA. He has done five major undergraduate research projects at Bethel, Invenshure Corporation in Minneapolis, Osaka University in Japan, and Cornell University. He sees the opportunity to travel to Sweden and take part in Nobel Week not only as an excellent professional networking opportunity, but a chance to improve vital international relationships that can have far-reaching implications. Following graduation in May, Coe plans to pursue a Ph.D. in condensed matter physics. He’s been accepted to five universities, all offering significant financial funding of his education, and is considering programs at Stanford, Cornell, and Harvard. He becomes the thirteenth Bethel recipient of the Seaborg scholarship since its inception in 1979. Bethel’s Department of Physics and Engineering ranks in the top 15 of undergraduate departments by size nationally and underwent an expansion and renovation in 2017. Significant funding from the National Science Foundation and other major partners supports student-faculty research, and Bethel has become a leader in the use of advanced labs nationally. New majors include Computer Engineering, Electrical Engineering, and Software Engineering—and the number of students studying physics or engineering is projected to increase as the program continues to expand.